Are you putting your best foot forward? A healthy set of hooves is vital for mobility, balance and independence. And yet, with the exception of the occasional pedicure, many of us forget to take care of our tootsies. Whether you are in the habit of running in worn out sneakers, wearing snug stilettos or skipping over sole soothing stretches, mileage and wear-and-tear will catch up with you. When your feet stop working properly, so do you. Preventative, foot-focused fitness is the best way to avoid the debilitating aches and pains associated with weak feet. For the following exercises you will need a tennis ball and a kitchen towel. Your Achilles Heel: the Achilles tendon runs along the back of the ankle, bridging the calf and heel bone. This exercise helps to keep this area loose, limber and reduce the risk of tension-related injury. Begin by facing a wall. Stretch your back by extending your arms higher than shoulder height and place your palms on the surface for support. Take a large step back with your left foot, keep your leg straight and heel pressed into the ground. Bend the right leg to shift your bodyweight as you lean in toward the wall. Hold this stretch for 30 seconds, repeat twice, then switch sides. Foot-Ball: plantar fascia is arch supporting connective tissue found between the heel and toes. When this area becomes inflamed from overuse, flat-footedness, a high arch or gait compensation, plantar fasciitis can develop. This exercise can alleviate any arch-related discomfort. Start by sitting in a chair with your shoulders back and feet planted on the floor. Place the tennis ball on the ground and position your right foot on top of it, between the sole and heel. Apply pressure to the ball as you roll it back and forth to massage the bottom of your foot. Continue this movement for at least 60 seconds, two times, then repeat on the left side. Piggy Pushes: this movement creates muscle contractions in the foot to help strengthen the surrounding muscle fibers. Strong and stable feet are vital for improving athletic ability and preventing injury. Remain in your chair and place the towel at your feet so the short end is closest to your toes. Position the top half of your foot on the splayed out towel. 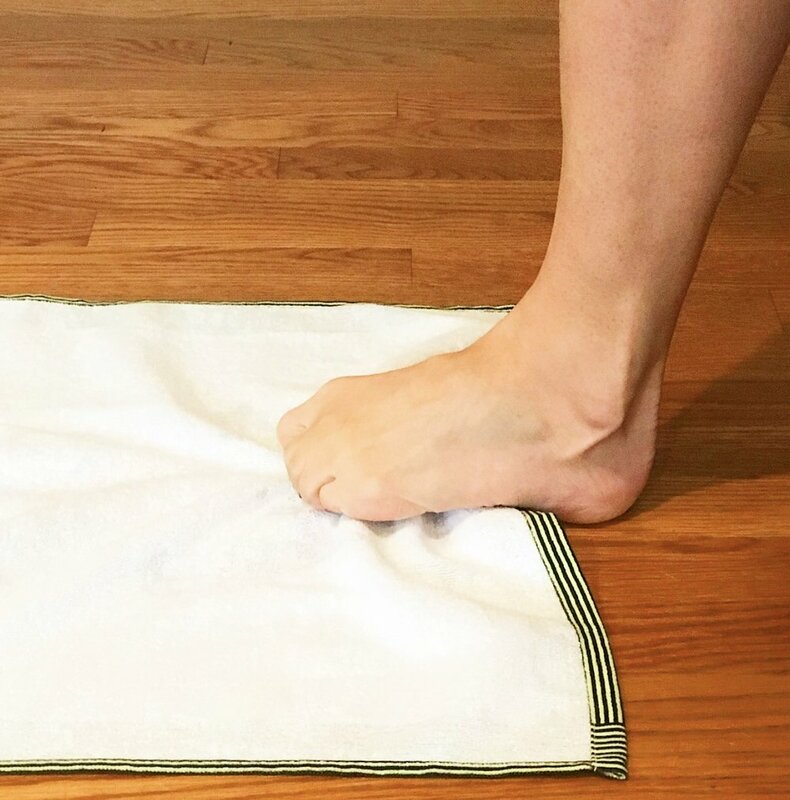 Keep your heel planted as you scrunch your toes and pull the towel in toward your heel. Continue crumpling the towel for 10 reps, then straighten the towel and repeat three times. When finished perform this exercise on the opposite foot. Good for the Sole: if you cram your feet into circulation constricting heels or ill-fitting shoes, chances are you’ve experienced painful foot cramps. This stretch is designed to relieve any tension that builds at the base of the foot to prevent this uncomfortable muscle spasms. From a seated position, cross your legs so the right ankle rests on top of the left thigh. Grasp the big toe on your right foot and gently bend it back toward your shin bone. Hold this stretch for 20-30 seconds then release. Repeat three times on each foot. Don’t let a lack of foot care leave you de-feeted.